This book gives a challenging point of view about science and its history/philosophy/sociology. Science is in decline. After centuries of great achievements, the exhaustion of new forms and fatigue have reached our culture in all of its manifestations including the pure sciences. Our society is saturated with knowledge which does not offer people any sense in their lives. There is a loss of ideals in the search for great truths and a shift towards an anodyne specialized industry whose main goal is the sustenance and procreation of an endogamic professional caste. A wide audience of educated people interested in these topics will most likely respond to the ideas expressed here as things they have thought about or observed, but have not dared to say out loud. "Lopez-Corredoira's account of the state of science is a harsh, but necessary contrast to the media-amplified non-results of current scientific practice. His historical and philosophical perspective is unique among science critics, but - one may say unfortunately - well grounded. As a truely original thinker, he's not afraid of anything or anybody while denouncing the decline of real science. Surely not an optimistic view, but it seems to be just true." "This book is dynamite. Corredoira is a whistle blower who is to be congratulated for having the fortitude to break ranks with the old boy's scientific network and expose what has come to be an unbearable situation. (...) Corredoira has given voice to problems in the practice of science that for a long time many of us have felt existed." "The general thesis of the book, that progress in science requires more and more resources to achieve smaller and smaller results, and thus science has to decline, is inescapable I think. The symptoms of this phenomenon, such as specialization and bureaucratization, that also become accelerants of the phenomenon, are also inescapable. (...) "The Twilight of the Scientific Age" is a grim read, but the arguments are, unfortunately, robust." 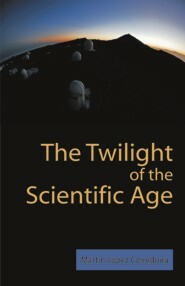 "The book by Dr. López Corredoira describes the way science is done these days. After a nice introduction on how high-impact scientific discoveries have been done in the past, he analyzes how the scientific world works, stressing in a very effective ways its current limitations, and its intrinsic incapability to lead to crucial discoveries. I feel he is mostly right, being myself deeply involved in the system. I recommend this book to any active researcher." "The message of this book is both simple and arresting: Success has spoiled science, in fact, has spoiled it rotten. (...) the author covers many of the sins of repression that must be laid at the door of the established scientific communication system (publication and refereeing). (...) he shows a remarkable sensitivity to the worm’s eye view peculiar to those the system grinds under its heel: the people who neither offer nor ask for money, but who offer unconventional ideas." Martín López Corredoira, Ph.D in Physics and Ph.D in Philosophy, is a tenured researcher at the Instituto de Astrofísica de Canarias (Tenerife, Spain), working in the fields of morphology and dynamics of the Milky Way and the observational foundations of cosmology. He is the author of more than 60 papers in international refereed scientific journals, several papers and books on philosophy, and editor of the book Against the Tide: A Critical Review by Scientists of How Physics and Astronomy Get Done (Universal Publishers, 2008).